I've forgotten where this info came from. Sorry! Edited by yours truly (contact me). The image came from Hollywood Online. 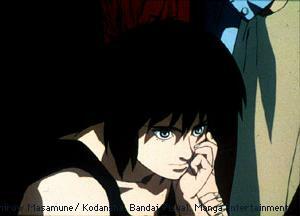 The Major, Motoko Kusanagi, works for Section 9. As part of her service, she was refitted with a full cybernetic body from Megatech and has become their strike specialist. The body is equipped with Type 2902 Thermoptic Camoflague (capable of passing through all basic scanners undetected) and the speed and power one comes to expect from a cyborg body. She is also skilled in various light, medium, and heavy weaponry. Even her brain is a cyber brain. With all this "change" to her, somewhere along the line, Kusanagi begins to question her own self (or as Bateau put it, "doubting her own ghost"). She begins to question her own identity compared to the vast sea of information. As an outlet for those probing thoughts, she goes diving in her spare time (her body is equipped with floaters that allow her to surface normally). Kusanagi somehow sees something important in the Puppet Master case: something the others don't see right away, and something that drives the Major into going beyond her duty and explore a matter which will have very deep consequences. Whether they'll be good or bad remains to be seen.